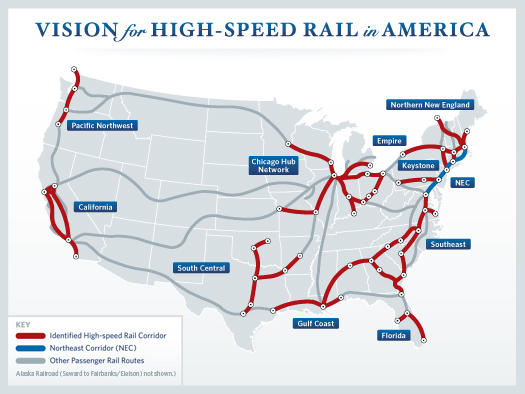 The third post I ever wrote for Brief Wit was about the Obama Administration’s overarching vision for high-speed rail in America and funding for it included in the Stimulus. The map and the routes were very inspiring, and while the $8 billion allocated is a big number, it’s a small fraction of what is needed to do the job. 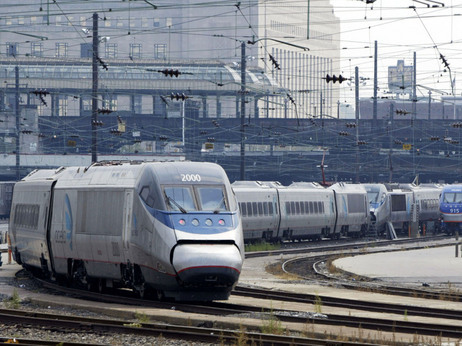 Fast forward to a week ago, when Amtrak unveiled details for building a high-speed rail (HSR) network for the Northeast Corridor, spanning Boston to Washington D.C. “The high-speed line would have four ‘hub’ stops: Boston, New York, Philadelphia, and Washington. ‘Super Express’ trains would stop only in those cities and make the 426-mile trip between Boston and Washington in 3 hours and 23 minutes (compared to the current 8 hours on Amtrak’s Northeast Regional trains or 6 hours and 37 minutes on Acela Express).” Second-tier stops would include Baltimore, Wilmington, Newark, and Hartford. The proposal will enable Red Sox fans and Yankees fans to argue in person in a mere 86 minutes! The facilitation of ballpark brawls will be something to marvel at. From there, they can make up and head down to D.C. together and rag on Nationals players in a little over an hour and a half, thanks to a 220 mph bullet train. The completed infrastructure would create thousands of jobs, reduce pollution, alleviate air and auto congestion (since the largest percentage of delays are in the Northeast), and generate an estimated $900 million a year. Awesome, right? The problem with this plan is that I will probably be eligible for Medicare when it is ready. It will take 30 years! Construction won’t begin until 2015 (and then take 25 years). 10-15 years was my initial hope for such a project. That’s at least attainably far off, still able to be visualized. Another problem? All are not aboard. In fact, nobody is yet: there is no funding in place, one of the reasons for the five-year buffer until building. It turns out that none of that $8 billion in Stimulus cash went towards this project, but instead to HSR efforts connecting Orlando to Tampa (by 2014!?) and Los Angeles to San Francisco, among other general rail projects. That’s better than connecting Juneau to Wasilla, but still. Also, just this week The New York Times reported on the possibility that Republican gubernatorial candidates (like Meg Whitman in California) will block funds their states received for HSR as part of the Stimulus, introducing a stupid and stupendous new term into the lexicon: anti-rail candidate. That would be something because Cali voters already approved $10 billion in state cash for the LA to San Fran line. The cost for the Northeast Corridor is pegged at $117 billion, which is no small sum, but doesn’t gall me as much as it has others when I’m reminded we put more than that into bailing out AIG. Y’know, it’s really too bad Mayor Bloomberg isn’t just a little bit wealthier, because then he could probably finance it. When I learned of this American time frame, it begged the natural question: has it taken this long for other countries, particularly China, to build HSR? The short answer? No. The medium answer? We are getting rocked by China, Japan, and many European countries on this. Do you think this vast gap is going to take some sort of economic toll over 30 years? And now, the long answer. The Chinese didn’t even really get the idea to build HSR until the early to mid-90s. They didn’t start building any HSR lines in earnest until 1999. And they have been building fast. Most of their projects are done within 4-8 years. (I guess part of this has to do with a unitary government that leaves scant space for debate, but that can’t account for the full discrepancy between our schedule and theirs.) 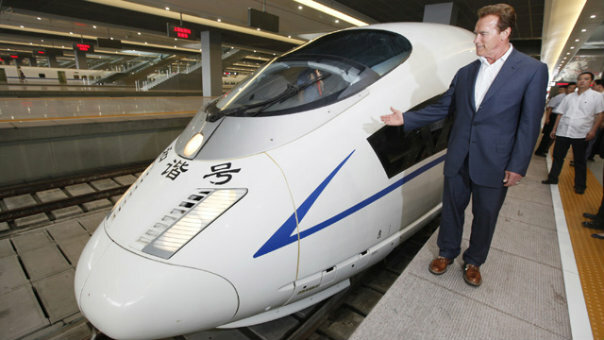 In fact, China currently has 4,300 miles of HSR track in-use today, and will have 8,078 miles by 2012 split over 42(!) lines. 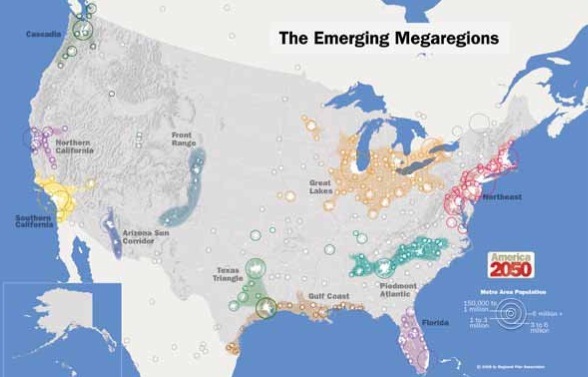 Its gains in this space are creating connections that have already begun to amount to a national and economic game-changer. China is investing in two major track types: very high-speed rail, for trains traveling at 220 mph; and “typical” high-speed rail, for trains traveling at 125-155 mph. “But the other reason China’s rail network design makes sense is that it will also take advantage of existing and slower-speed tracks, which represent the vast majority of the country’s total passenger rail mileage.” Furthermore, China’s not letting itself be constrained by its own borders. It’s trying to build a link to Europe, and it’s already spoken to 17 countries about it. This would be the largest infrastructure project ever, and they are aiming to do it in 10 years! On top of that, Chinese (and virtual all) HSR speeds are faster than ours will be. There is no agreed upon benchmark definition of high-speed rail, but no country pegs it below 120 mph, except the US, at 90 to 110 mph. (I came across conflicting positions on this.) Keep that in mind during these examples. 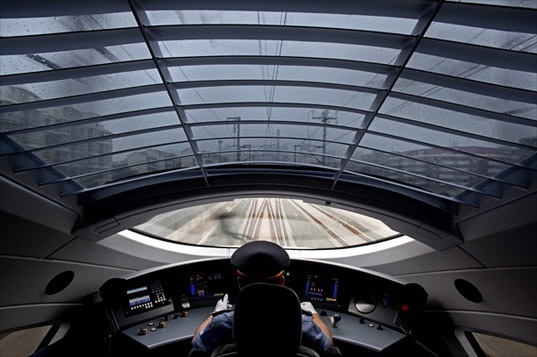 France’s TGV train blasts passengers from Paris to Avignon at 158 mph. The United Kingdom is planning a train that gets up to 250 mph. Finally, last week China announced that one of its trains just set a new speed record at 258 mph. As Inhabitat remarked, if the US had a train like that, a trip from New York City to Chicago would take about 3 1/2 hours. Ultimately, I am glad we are making a step towards HSR, yet there is also a damper on it knowing that the vision won’t be realized anytime soon. It’s kind of a downer for America. Now, all things being about equal, I’d like to buy American every time. But if China, Japan, and others are clearly outdoing us in production time and train speed, maybe we should bring them in to help make these lines, kind of like how the auto industry has evolved into Honda and Toyota having major factories for those brands with American workers here. The world has never been more interdependent, after all. PS Man, I hope someone got that Clash reference. approximately! Bookmarked. Please additionally visit my site =).